My company has started a top-down transition to Scrum and Kanban. Will that make us an Agile company? About 2 years ago, I attended a conference hosted by the Swiss Association for Quality on the topic of Agility. As a warm-up exercise, the participants were given the 4 values of the Agile Manifesto, then asked to arrange themselves in space. How Agile is your company? How Agile do you think it should be? Very Agile on left, very traditional on the right. There was a cluster of people standing well to the right of center. “Why are you standing on the right?” It turns out that they were all from the railway. “Our job is to run the trains on time.” They were uncertain whether this agility thing was really aligned with their purpose. Is Agility limited to software? What is this mindset? Where does it come from? How do you know that you or your company has it? And is it really missing from the Agile Manifesto? I believe The Manifesto for Agile Software Development (“the Agile Manifesto”) does define a mindset. This mindset leads you to the 4 values, 12 principles, and uncounted practices that are helpful in software development. This mindset also leads you to the five shifts of Radical Management, which are much more generally applicable. If Agility is mindset, then it starts in the head. It starts in the head of each individual. It starts in the head of the company, i.e. its leadership team, and it starts in the heads of the individuals that make up the leadership team. I believe that you can assess the Agility of an organization through five simple questions, all derived from the Agile Manifesto, even if they are not primarily developing software. You can ask these questions to their leadership, and you can get confirmation from by asking their staff or customers the same questions. Let's look at how the Agile Manifesto defines the mindset, then derive a set of questions based on that mindset. Let's take the case of a hypothetical railway: How would a railway apply the Agile Manifesto? How could an organization that values operational goals, like having the trains run on time, be Agile as well? The most neglected part of the Agile Manifesto? We are doing. It's not about software quality, it's about uncovering better ways to develop software. It's about the process and not the result. We don’t have the best practices, we are constantly looking for better practices. We are open to the possibility that someone else has a better idea. We expect to be better tomorrow than we are today, so we maintain a certain humility about our knowledge today. We are helping others to do the same. Not teaching, helping! Sharing knowledge, especially beyond the borders of our own organization, enables our own learning, enables us to learn from others, and builds overall knowledge faster. This clause defines our relationship to other people and organizations. We are uncovering better ways of doing what we do, by doing it and helping others to do the same. For context, Chrysler introduced modern cup holders with the Chrysler Voyager back in 1983o3. My 1993 BMW 3-Series did not have them. My 2001 BMW 5 Series had pretty flimsy cupholders, and my wife's 2011 BMW 5 Series finally has pretty good cup holders. What was missing here? A culture of learning, particularly of learning from outside the organization. An Agile organization is a learning organization. An Agile organization will be looking for, validating and embracing new ideas quickly, so that they can get better at doing what they do. What does it mean to have an “Agile Mindset?” At the very least, someone who has the mindset is in alignment with the first sentence of the Agile Manifesto: We are uncovering better ways of doing what we do, by doing it, and helping others to do the same. The first question: What do you do? What does your organization do for its customers or stakeholders? The answer must contain a verb, and should represent something of value to your customers or stakeholders. So making money is not what you do. It is a result of what you do. Even the choice of mission says something about what the organization values, which may in turn determine its ability to meet the challenges of the 21st century. If our train system just wants to run the trains on time, how capable will it be to respond to new market challenges like digitalization (Uber, Zipcar, Mobility) or technological advancement (electric cars, self-driving cars)? Are you uncovering better ways of doing what you do, by doing it? This is about your culture of change and improvement. If you prefer the status quo, you are unlikely to be uncovering better ways of doing what you do. Are you uncovering better ways of doing what you do, by helping others to do the same? “Helping” is a peer-to-peer activity, not a top down activity. So this not about getting training for your staff, this is about advancing the state of your art, having time to improve skills and technology, and learning and sharing beyond your own four walls. Our highest priority is to satisfy the customer through early and continuous delivery of [Customer visible value]. There are no straw man arguments in the Manifesto. Intelligent people can and do value all of these things. In the experience of the Manifesto's authors, emphasizing the points on the left produces better results than emphasizing the points on the right. For example Scrum, a leading Agile framework, strives to ensure that the right people talk to each other about the right thing at regular intervals. If followed, the Scrum process ensures that this happens. By putting valuable things in relationship to one another, Agile values become a tool to guide decision making, which in turn enables more distributed decision making. Must an organization embrace these values to be an Agile organization? This is a harder question, because context can be very different. What would an Agile police force or military unit choose to value? What would our hypothetical train system value? As a frequent user of the Zurich public transportation system, I believe that they want to provide a high level of service to their customers, defined as on-time performance, frequent connections, ease of use, and comfort. But if they catch you without ticket, they have no mercy, and they don't care about your reasons! Ensuring compliance with ticketing rules or showing compassion to loyal customers? How would our Agile train system decide this case? Would they want to handle it differently? Answering this question requires thought, and who is best positioned to make this decisions? The people who understand the problem best. An easy-to-remember time table or having enough seats for all passengers? Trains departing on time or passengers making their connections when their train is late? Minimizing operating costs or having a train available frequently and regularly? Ensuring compliance with ticketing rules or showing compassion to loyal customers? Our hypothetical train system could prefer either side of these pairs, and still be “uncovering better ways to run trains.” While valuing compliance over loyalty seems to come in conflict with the first Agile principle, it might be necessary to ensure the existence of the train system. An Agile organization knows what it values and why. An Agile organization has reflected on its values, using the values of the Agile Manifesto as its starting point, and can explain why it values what over the things it does not. Questions 4 and 5: What do you value? Have you reflected on the values and principles of the Agile Manifesto and what they mean for you? Can you concisely explain your values and why you value them? What do your staff and customers think? On a scale of 0 to 10 (highly unlikely to highly likely), how likely are your customers or staff to describe your company as an Agile organization? Now go ask your customers, stakeholders, and staff the same question! (Thanks to Raphael Branger of IT-Logix for this suggestion!). Comparing your internal perception with the external perception is both a reality check and your first opportunity to start uncovering better ways of doing what you do! What do you do (besides make money)? On a scale of 0 to 10 (highly unlikely to highly likely), how likely are your customers, stakeholders, or staff to describe you as being Agile? I started interviewing the leadership of various companies that have an affinity to Agile. The first feedback has been, “this provokes interesting discussions!” and “let's give this to our customers and see what they think!). As I get more data, I will share in this forum. I have created a one-page questionnaire ("Peter's 5 Question Assessment") which you can use to conduct this assessment. I call it release candidate two, because it is a work in progress. Feel free to try it out, and please send me suggestions, improvements, and data! 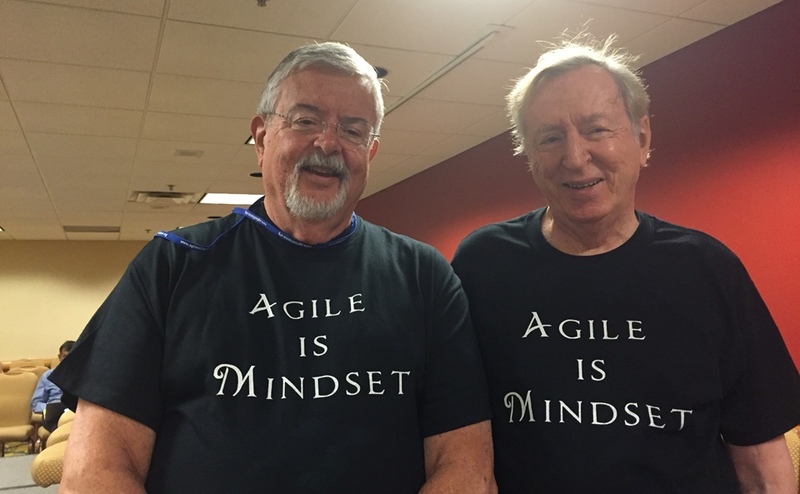 2 What's missing in the Agile Manifesto? Update: Added link to the assessment. Excelente articulo, la mayoria de evaluaciones, índices o seguimiento de procesos o transformaciones ágiles solo persisten en evaluar el uso del método(SCRUM), los KPI, La madurez sin saber que todos estos son abrazados por una manera de pensar y sentir la agilidad.